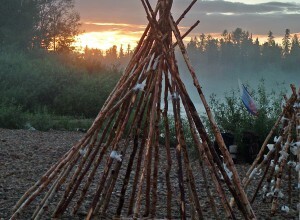 The workshop took place during five days in August 2007 at the Man Uskve Camp, near the village of Saranpaul, Beryosovsky District, in the Khanty Mansi Autonomous Okrug. The objective of the workshop was to bring together dedicated Khanty and Mansi youth interested in the study of their architectural heritage and committed to its protection and development. The workshop furthered a deeper reflection about the cultural relevance of this heritage and their vanishing building traditions, showing the strong connection to aspects of their communities’ way of life and cultural identity. 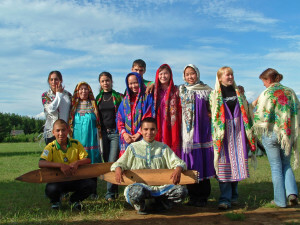 The group consisted of Khanty and Mansi boys and girls between the ages of 15 and 22. It assembled young people with diverse interests and aptitudes: some tradition-oriented with a strong interest in their own history, others attracted by computers and new technologies; some equipped with organizational talent and leadership qualities, others with creative and artistic skills. Community elders respected for their traditional knowledge accompanied and supported the group during the workshop. A core theme of the workshop was the important function of architecture as a vehicle to perpetuate and project a people’s way of life and cultural values. It was illustrated how every building becomes an occasion to express who we are and that to which we aspire, showing how dangerous it is for a society to leave that responsibility in the hands of strangers, thus allowing itself to be “defined” by others. Through a visual presentation, the participants were exposed to the impressive diversity of dwelling types developed by indigenous peoples all over the world, each an efficient and sophisticated answer to even the most extreme geographic and climatic conditions. They also discovered how cultural factors, such as the social structure, religious beliefs, or the economic system, give shape to these architectural forms. Finally, they saw examples of how many traditional societies around the world are continuously asserting and redefining their cultural identity through their architectural choices. With the aid of the local elders they attempted to gain a deeper understanding of the fundaments and essence of the architecture of the northern indigenous peoples of Siberia: Its origins and historical evolution, climatic factors, building materials and techniques, typologies, permanent and portable dwellings, symbolism and iconography, the role of the craftsman, recent developments and influences and choices for the future. While visiting the remains of an ancient village, the students consulted with the elders in order to tap into the memory still alive in the communities. 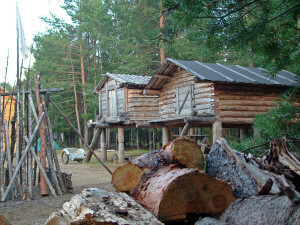 The past and present habitat and village life of the Khanty and Mansi were compared, evaluating differences and similarities and assessing the benefits and disadvantages brought about by change. Equipped with their new basic graphic skills, the participants had the opportunity to try themselves as architects through a design exercise. 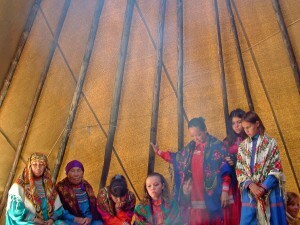 The Khanty and Mansi communities are planning for the coming years the construction of a Health and Recreation Center in the region. This presented a good occasion to allow the young boys and girls to develop their own vision of what this centre could be. In this endeavour, they were encouraged to make the most out of their communities’ existing resources, promoting local materials, reviving vanishing building technologies, and restoring the central role of the traditional know-how and craftmanship. A few of the participants travelled to Khanty-Mansiisk directly after the workshop to prepare a final presentation of their drawings and designs, which they displayed at a small exhibition to which the local authorities and academics were invited. At the end of each day, the participants were able, in the context of the yearly youth parliament which took place simultaneously at the same venue, to reflect upon the new information and experiences, sharing it with other young parliament attendants as well as with the elders present at the camp.